What did we do with all that top soil delivered back in February? We created new gardens in the back yard. The main work went into this 24' diameter garden which we refer to as "the wheel". The formal name for this style garden is parterre, but this is a Texas style parterre and quite informal so wheel garden it is. While not exactly reinventing the wheel, this garden has reinvigorated a scruffy spot in the back yard and provided a nice sunny spot for growing native and adapted plants. It was worse than a blank slate back in 2009 when we had just reclaimed our home from a series of renters and the drought hadn't even kicked in yet. This area, like everything else both inside and out, needed attention. The fence was falling apart and the green shown here is mostly weeds. We temporarily directed our efforts to the front yard and ignored this spot for a while. This area really began looking bad a year into the drought when the weeds died and the buffalo grass went dormant. It made a pretty good golf driving range though. By fall of 2011, the drought had obviously taken its toll. Even the weeds were struggling and thin soil over a rocky slope was not a good place to plant anything. A new approach was needed. We decided on a circle garden because terracing across the yard would have been too involved for a DIY project. The circle allows access from the shed to other parts of the yard and rain runoff goes around it or is used by the garden. The 48" diameter center circle was laid out and planted in the fall of 2011. The surrounding wedges were added in the spring of 2012. Leftover fence boards were used to lay out the pathways. After the boards were in place, we walked through and around the circle changing the boards until the direction of the paths connected comfortably with other points in the yard. Over to the right a new screen porch fitted with salvaged windows is under construction. We used rocks from the yard to line the beds and measured every few feet to make sure the beds stayed even. No point buying rocks when these are free and indigenous to the site. It's also a nod to the Hill Country tradition of lining paths and flower beds with found rocks. The wedges were filled with top soil and compost. This spring the bluebonnets looked great both in and around the circle. The interior paths were lined with landscape fabric and then filled with gravel salvaged from the front yard. The plants are kept low to allow a view of the trees and creek from the gate. Far from being an impediment the circle has created a very pleasant plant and flower-filled transition to the shed. The gravel path from the deck is most helpful when it rains to keep shoes from getting muddy. The circle is planted with ornamental grasses, native and drought tolerant perennials, and a few annuals. While the plantings are not precisely laid out they are tied together with Ruby Crystals grass (Melinus nerviglumis 'Savannah') planted at both ends of each wedge along the spokes of the wheels. Eventually the spokes will connect paths that lead to other areas of the yard and shed. Now I look forward to seeing this area and occasionally walk out here just to stand in this garden. Building this circle garden has made a huge difference in how we view the backyard. It's so nice to have this garden finished. We have many more projects planned for the back yard so it will keep getting better from here on. In early may my barrel cactus propagation post showed how we removed and planted pups from a native barrel cactus. One of the pups is blooming for the first time today--just about three months after being separated from its parent and planted out in the new cactus garden. Not much more than one inch tall and already blooming like a grown up. Quite an achievement for this little fellow. They must be programmed to bloom on under specific weather and moisture conditions because the older cousins are also blooming out front today, so four blooming barrels on the same day. This is the second set of blooms for this one in the past couple months (note the red berries produced by previous blooms). Several people have commented on the spirals in these cacti, which is a little unique. And the smaller one taken from it last year is also blooming today. It's so hot, but this got me out to check these blooms which are so bright and pretty I can see them from the house in this bright sunshine. The blooms close at sundown and only last one day. The selection for today's post on ABCs of plants in my garden is J for Justicia. Both the Shrimp plant and Mexican honeysuckle are the common names of two very different types of Justicia in my garden. I enjoy the special shapes of the flowers on my Shrimp plant or Justicia Brandegeana. Though I have seen shrimp plants available in local garden centers, these plants were shared by generous gardening friends. The shrimp shaped part of the bloom is actually a chain of bracts that continues to multiply until it falls off and the blooms are the little pink flowers. This red shrimp plant is a bit stunted here since the deer got to it in the spring. I also have a yellow shrimp plant which is not currently blooming for the same reason. Here's a bloom from last fall. The deer usually ignore the shrimp plants, but this past spring they went after them. Now that the plants are recovering I consider these somewhat deer resistant. If I avoided all plants that deer nibble from time to time I would have very few plants to choose from. In my garden these shrimp plants get sun early and late but are not in the full sun all day. They are watered every few days along with all the other plants in the bed depending on the heat. While the shrimp plants did not die completely back this past winter, the blooms did slow down and the plant dropped some leaves. The next is Justicia spicigera or Mexican honeysuckle. I planted this Mexican honeysuckle plant in the front yard last fall and it is doing well out there among the yucca and agaves with just a little water each week. The Mexican honeysuckle has bright orange-red flowers. It did not die back in our recent mild winter and bloomed right through the winter. This one gets water about once a week in the summer and does not wilt so it is quite drought tolerant. Mine is still small so here's a look at mature one in the blue adobe courtyard at The Antique Rose Emporium here in San Antonio. All of these Justicia are native to Mexico and Central America but have adapted well to our climate. These are great plants for our gardens here in south Texas. This plant was incorrectly identified in the original post. I have revised this post to show the correct plant ID as Ephiphyllum hookeri. The night blooming cereus (Epiphyllum hookeri) is both beautiful and easy to grow, but there's one catch -- trying to actually see the blooms. One of the common names for this plant is Queen of the Night and it is so appropriate for these gorgeous blooms which disappear quickly at dawn. I posted about the closing of the blooms for Garden Bloggers Bloom Day and this week I captured the blooms fully open on a cloudy morning. The blooms are supposed to begin opening around 10 p.m, but the ones on this plant don't seem to open until the middle of the night. My friend Ragna shared this plant when her neighbor downsized to an apartment and no longer had room. I wasn't sure I wanted to grow them but now I'm hooked and, as a form of cactus, they could not be easier to grow. After sticking the cuttings and rooted pieces in a well-draining potting mix and watering them in, I basically ignored them. Imagine my surprise when I found four buds several weeks later. The foliage is not quite so stunning as the blooms. It's somewhat messy but it does have an interesting structure for a hanging basket or large pot. They do need protection from frost and heat above 100F/38C which means I'll need to keep them in the shade this week as we are predicted to reach 104F/41C. These two agaves somehow knew this was the last chance to show their stuff. A few weeks ago I wrote about the blooming of this Agave Ovatifolia I had often admired at The Antique Rose Emporium here in San Antonio. On Friday 15 June, I returned as promised to follow up on the Agave Ovatifolia bloom and check out the enormous Agave Americana bloom going up just behind the adobe courtyard. In response to questions from readers my plan was to follow these two agave plants as they reproduced and then died off. That's not likely to happen now since the next day news arrived in the form of an email from The Antique Rose Emporium. They will close the San Antonio location in July due to downsizing. The store in Independence near Brenham will remain open along with the mail order business. Here's another view of the Agave Americana, the base plant is over nine feet high and the bloom appears to be 30 feet high. I will miss these gardens and the staff whom I have gotten to know over the years. 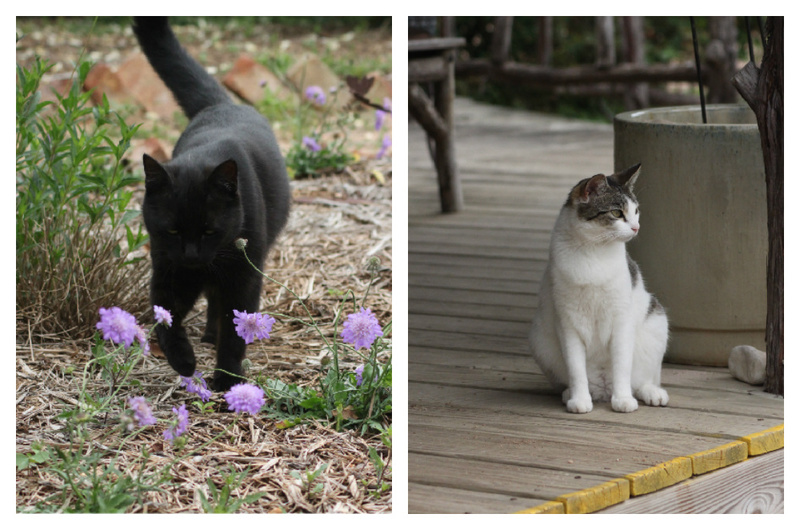 I'll also miss the resident cats, especially Spot (on the left) who has followed me around on many a visit. About the time I turned my attention to the landscaping at our home here in San Antonio in 2009, I also discovered The Antique Rose Emporium nursery and demonstration gardens. On that first trip to visit these gardens I knew I had found my inspiration. Walking through the large center courtyard planted with drought tolerant natives and adapted perennials was an eye opening experience. This beautiful display is San Antonio gardening at its best. Standing there that day, I immediately realized that my expectations about what could be achieved in my own gardens needed to be revised upward. I never wanted a rose garden and, actually, I still don't. At The Antique Rose Emporium there are no formal rose gardens. The roses are combined with perennials, cactus, annuals, and succulents to spectacular effect. I often marveled at the vision that went into creating these garden spaces. There are so many special spots here. The adobe courtyard is a place I could spend all day. It's Garden Bloggers Bloom Day (GBBD) hosted by Carol at May Dreams Gardens. For June 2012 I'm focusing on three special blooms, each with its own story. This gorgeous canna bloom is the most amazing shape, color, and scent. The story behind it makes it even more special. It was grown from seeds sent to a gardening friend here in San Antonio by a gardener in Trinidad and Tobago who enjoys creating new cannas for his collection by cross pollinating. About a year ago Barbra divided the plants and shared a few with me. I call this canna 'Trinidad" but it has no official name. The flower is a soft pink and curves downward more than most cannas. The new flowers unfurl in a pattern similar to a bird of paradise. The sweet tropical scent is a bonus. This vigorous spreader and prolific bloomer is not fussy either. I typically grow cannas in pots on the deck for summer color. Here in zone 8b I can leave cannas out all winter. The Night Blooming Cereus (Epiphyllum oxypetalum) has had several blooms this week. This one is from last night and I didn't get out there to check until this morning but I still enjoy seeing the blooms in their various stages. This is the first time I've grown the night blooming cereus and the cuttings were passalongs from Ragna. These were stuck in a pot back in May and ignored so it's very easy to grow here though it does need winter protection. This is a Sanseveria bloom and there are two at once in this pot on the deck. It's a first ever for me to see one of these bloom. Sanseveria was one of the plants I grew in my room back in high school so I've grown many of these over the years. Since none have ever bloomed for me it was indeed a surprise and special event. This plant was shared with me by gardening friend Patty. The blooms are lily shaped and delicate. The sanseveria will only bloom once at each cluster though the foliage does not die after blooming and will continue to create offsets that will eventually bloom. Three special blooms on three special plants from three special gardening friends makes for a special Garden Bloggers Bloom Day! Join Carol at May Dreams Gardens as bloggers from around the world share their blooms on the 15th of each month. To Her Majesty the Queen!